Colchones There are 41 products. Padded with soft polyester fiber. Latex core 100%. 5 different rest areas. Removable outer cover. Hygienic interior cover. Ideal for articulated bed bases. Hygienic Protection Triple Barrera. Made in Spain. Height 18 cm. Padded with ViscoFoam® + athermic fiber.Comfort cover: high density polyether.Shock absorber: high density polyether.Hybrid System®: Normablock® springs + comfort cover.Double-sided: Use on both sides.Good bed independence.Hygienic protection Triple Barrera®.Made in Spain.Height 26 cm. 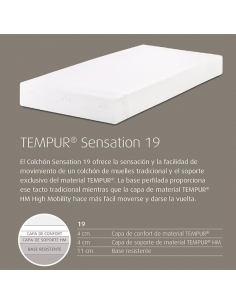 Padded with ViscoFoam® + athermic fiber.Comfort cover: High density polyether.Core: High density Confortcel®.High bed independence.Hygienic protection Triple Barrera®.Made in Spain.Height 28 cm. Pocket spring mattress regardless of body movements durantes rest because of their block of pocket springs. 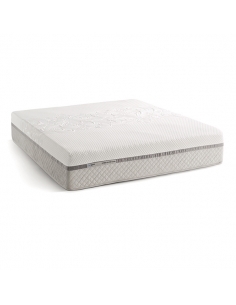 This mattress is ideal for placement on a hinged base adjusting to the weight and morphology of each person. Antiácaros has full sanitary protection, bacteria and fungi and is removable with zip. 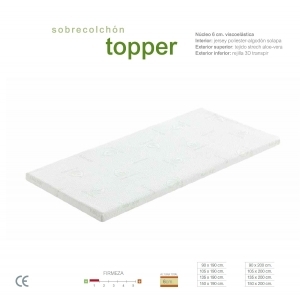 Padding in Progression Visco®.Shock absorber in high density polyether.Hybrid System: Normablock® springs + advanced padding.Maximum bed independence.Hygienic protection Triple Barrera®.Made in Spain.Height 30 cm. Padding with Progression Fiber®.MicroPocket System®.Shock absorber: High density polyether.Hybrid System®: Normablock® springs + comfort covers.Maximum bed independence.Hygienic protection Triple Barrera®.Made in Spain.Height 32 cm. 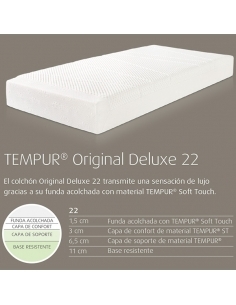 Colchón Original Deluxe 22 que garantizará un soporte y confort óptimos para su cuerpo. Buen grado de firmeza y extra confort. 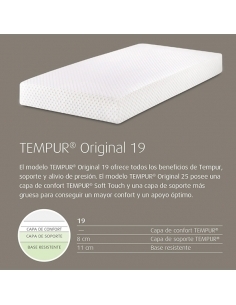 Funda con material TEMPUR® no lavable. *Colchón disponible para ver y probar en nuestra tienda-exposición. 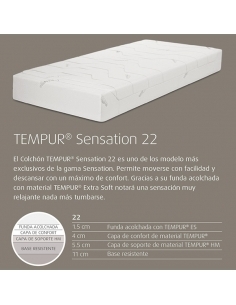 Colchón viscoelástico Sensation 22 con funda acolchada de material TEMPUR ES (Extra Soft). Gran facilidad de movimientos gracias a la capa TEMPUR HM (High Mobility). La funda se puede quitar para su ventilación. Compatible con somieres articulados. Tratamiento antiácaros e hipoalergénicos. Cumple con la norma Oekotex® 100.